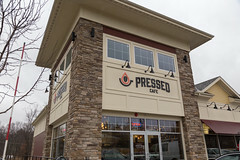 Opened by the same restaurateur behind the excellent Mint Bistro in Manchester, Pressed cafe is a small local chain, with locations in Nashua and Burlington, MA (with another coming to Bedford to the complex next to the new Whole Foods). In a marketplace that’s already crowded with fast casual eateries (heck, I think standing at their door, I can probably see a Chipotle and a Panera), it was a bit of a bold move, but Pressed Cafe starts with a simple concept (several panini presses, hence the name), puts a twist on it (focusing on fresh, natural ingredients), adds in a breakfast menu and some fresh-squeezed juices, and they’ve been having a fair bit of success. 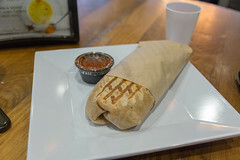 Menu-wise, they’ve got an impressively large menu with literally dozens of breakfast and lunch burritos, wraps, salads, soups, and sandwiches. Normally, a menu this large is a bit of warning sign to me that a place is trying to do too much, but looking at the menu a bit more carefully, you can see that they are primarily leveraging most of the same ingredients several different ways. Opting for their chipotle steak and egg burrito and a coffee, I then found a seat after helping myself to some of their surprisingly refreshing complimentary “detox” water (water with fresh mint and ginger added). The burrito came out shortly, and while it doesn’t really photograph well (a perennial problem with burritos: they basically look like a near-featureless dough capsule), I was quite happy with the results: perfectly cooked up scrambled eggs, some homefried potato, onions, peppers, a light smattering of jack cheese, and some tender chunks of smoky, marinated steak, this was a very well executed burrito, and it really did satisfy my cravings. The flavors were good and fresh, and, while my Southwest-calibrated tastes really want something a bit more bold and spicy, the overall flavors of the chipotle salsa were well-rounded and flavorful. So, I found myself rather liking Pressed Cafe. 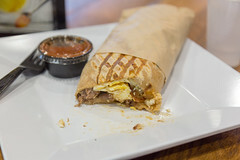 It’s a nice, refreshing twist on the fast casual concept, and they’ve got a great breakfast burrito. The lunch options looked particularly nice as well, so hopefully at some point I can give their lunch menu a try as well. (Closed) Ever since they opened this Spring, I’ve been getting people asking me if I’ve tried out 3 Guys yet, and if so, what I thought. I’ll be honest, it took me a while to get over there and try it. First, I’ve been traveling a lot this spring and summer (as I write this, I’m sitting at a gate a BWI…), and I’ve barely been around Hanover to check it out. Seocnd, I’ll be frank, it wasn’t my top priority—I’ll be the first to admit that I’m more than a bit of a BBQ snob (check out my various BBQ reviews) for a sampling). In particular, I’d recently completed two trips to Texas, both featuring pretty good BBQ. Meanwhile, my general experiences with BBQ here in New England have generally been…. very, very disappointing. To the point where I believe that the phrase “New England BBQ” needs to trigger “Danger! Danger, Will Robinson!” sort of alarms, and an accompanying adjustment in one’s expectations. Oh, it’s not completely dismal, there actually are a few decent BBQ joints hiding out there, but they are interlaced between some truly horrendous places (here’s where I need to plug the excellent Northeast BBQ review site, pigtrip.net, which has allowed me to find several of these gems in my travels). So New England BBQ joints don’t exactly trickle up to the top of my priority list. But last Thursday, I found myself needing lunch, and with an important choice on my hands: go find lunch someplace, or attend our corporate Wellness seminar on “how to pack a healthy lunch.” My choice was made for me… I grabbed a handful of coworkers and we went to 3 Guys to finally check them out.